I discovered a new facet of Beijing last week-end thanks to Beijing Sideways. One friend won during one of our party a 2 hours side-car tour for 2 and he kindly invited me. 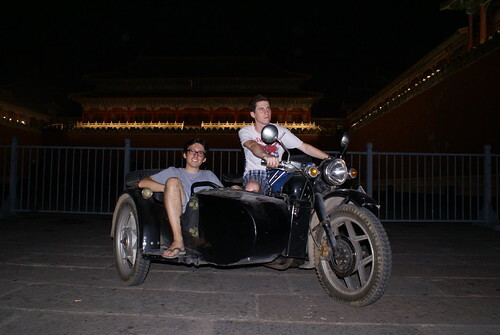 We selected the night tour which drove us to some illuminated neighborhoods (CBD, Tiananmen Square…) and to some dark places where we used only side-car light to see the road. Our guide for this tour was french and one of the co-founder of this company so we have been able to exchange some tips on the city and discuss about the expat life (pros and cons to create his own company in China). We really defined our tour with him then we removed some places that we already knew (Bird Nest) and some others (Bell Tower) – A good point for Beijing Sideways… Our tour started at Yonghehong – Lama Temple around sunset. We moved to Guomao (CBD) to view all these incredible buildings. After few minutes on big avenues, we arrived in a typical chinese hutong without any lights and ride on alleys using only our motorbike light. It seems that our guide comes often in those narrow streets as lot of residents wave to him during our passage. It was a really good experience that allows us to discover Beijing from an other side and receive lot of precious tips and historical details. 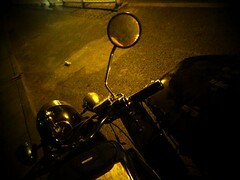 Moreover, riding this incredible city on a “old schoold” side-car was awesome!